Here is our collection of simple ways to fax Google Docs files (Docs, Sheets, Slides, and Forms). Some options (such as an online fax or connected fax machine) will allow Google Docs to email directly to a fax number. Alternatives (such as fax software) do not directly use Google Docs but provide a similar interface for sending and receiving faxes. If you can’t find a way to directly fax your Google Document, there’s always the option of printing the document and faxing it through a traditional fax machine. An online fax service is a virtual fax machine that can send and receive faxes on your behalf. The service provides the fax number (or lets you port your own in). Users can send and receive faxes through email, a web interface, smartphone app, or computer program. No phone line or fax machine is needed – only an internet connection. Most fax services can fax through Gmail (or a different email application) as an email – when sending, an email is composed with the main body of the email becoming the cover page, and the attached file converted over to the main part of the fax. When receiving, the fax arrives directly to Gmail as a received email with the received fax attached as a PDF. Some fax services have further integration with other Google Docs & Drive programs – with this integration, a menu is added to a Google Docs file that will send the fax directly from the file. 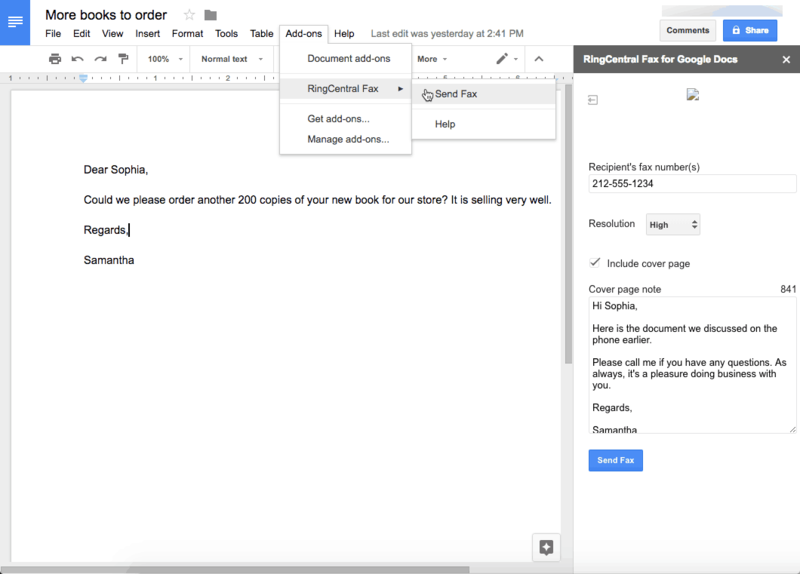 Some online fax services (in this example RingCentral) have an add-on to fax directly from Google Docs, including the ability to add a cover sheet. Some services also have the ability to archive old fax transmissions directly to Google Drive. This can be helpful for ensuring fax data is SOX compliant. Some models of fax machines (or multifunction printers with a fax option) can send and receive faxes to and from your computer or smartphone. Usually, faxes are sent via the print driver, sometimes there is software just for the fax function. When faxing with the print driver, choose “File – Print” from the Google Docs file the same way you would print the document. Select the connected printer (or fax machine) with the fax feature. With some fax machines there will be an option to fax within the print driver, with others there is a different printer to choose (typically called the same as the regular printer but with “fax” added). Some fax machines have an alternate printer driver for sending faxes. Follow the same steps as printing the document to send a fax. Some fields including the fax number to send to will show. Enter the fax number and add any other necessary information. Press send to send the fax. When sending the fax, you’ll need to make a cover page for the first page of the document. Most connected fax machines do not automatically generate a cover page. Windows comes with Windows Fax and Scan pre-installed since Windows Vista (Windows XP came installed with Fax Console). Linux has some different software packages (including ones that work with enterprise-level fax servers). Google Docs cannot be directly connected to Windows Fax and Scan. You’ll need to download the file (preferably as a PDF or Word document) and then attach it to a new fax in Windows Fax and Scan. Fax software acts and feels very much like an email program (except you are sending to a fax number). With both Windows and Linux, the document would need to be downloaded from Google Drive (often as a PDF) then faxed through the software. Sometimes the easiest way to fax a Google Docs document is to print it and fax it through a traditional fax machine. If you need to set one up, we have a page on how to use a fax machine. If you don’t have one nearby, we keep a list of places that might have a fax machine you can use. The fax service RingCentral has a browser add-on that can add a direct “send fax” button to Google Docs. What are the most popular ways to fax a Google Docs document? An online fax service and connected fax machine are the most popular methods for faxing from Google Docs. What are the most popular alternatives to faxing a Google Docs document? Printing and faxing the fax using a traditional fax machine is the most popular alternative. Can I send a fax directly from a Google Docs file? Most of the time no. RingCentral does have a browser add-on that will enable it. 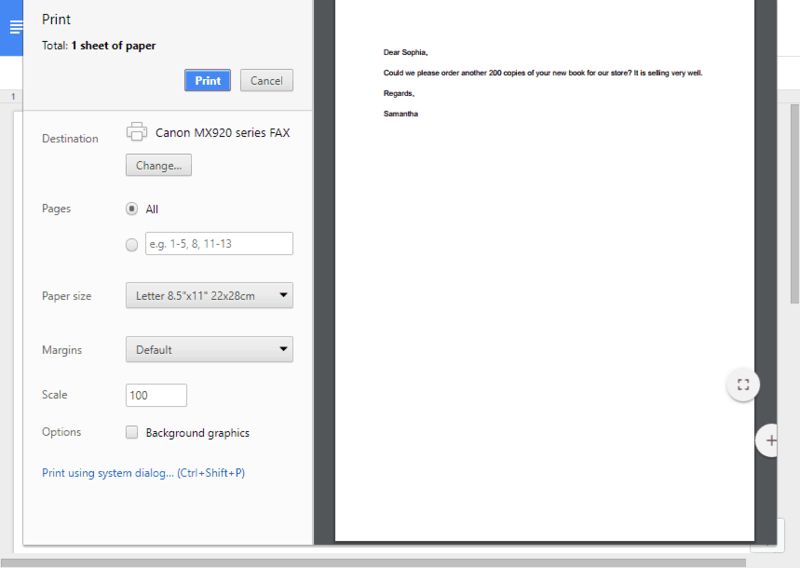 Is it easier to fax with Google Docs compared with a different office suite? 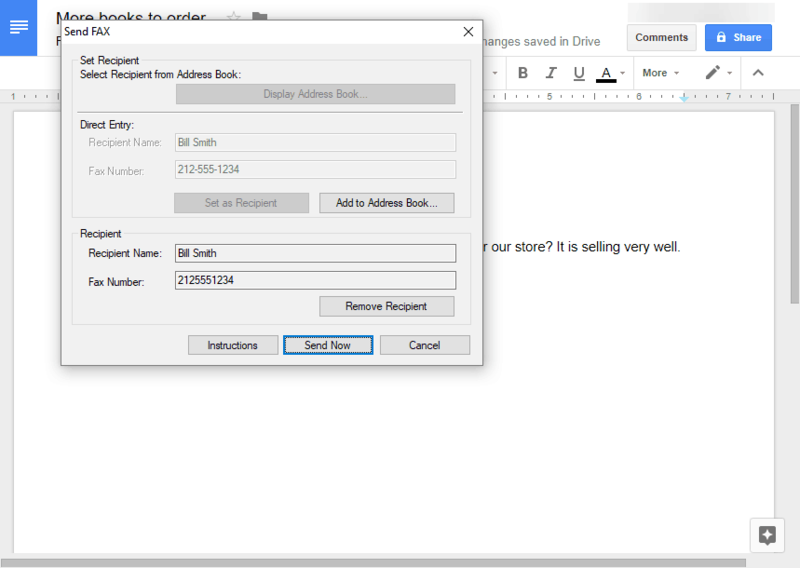 Fax service, fax software, or connected printer using the printer’s software: We find Microsoft Office documents easier to fax as the file format is compatible with a wider range of fax services and fax software. Some fax services also support the Open Document Format used by LibreOffice. When faxing with Google Docs (as well as Apple’s iWork or ZoHo Office), the file has to first be exported as a PDF or Word document. This adds an extra step to the process of faxing, and can also mean that parts of the page move or are not “exact” to their original layout in the file. A connected fax/printer using a print driver: We find all options about the same. Most of the translation from the document to fax format happens during the “print” process that is used with a connected printer. Can I fax a Google Docs (docs, sheets, slides, or forms) document in its native format? Fax service: No, although it may be possible. Most fax services have a list of file formats they can convert, and Google Docs compatibility is rare. If a service offers a plugin for Google Docs, it will likely understand the format. Most of the time you’ll need to download the file as a PDF or Word document before faxing it. Connected fax machine: Usually yes. Theoretically, a connected fax machine should be able to fax any document that is a standard paper size (letter, legal, A4). Fax software: Probably not, although it depends on the fax software. Most will require the file type to be a PDF or Word document. 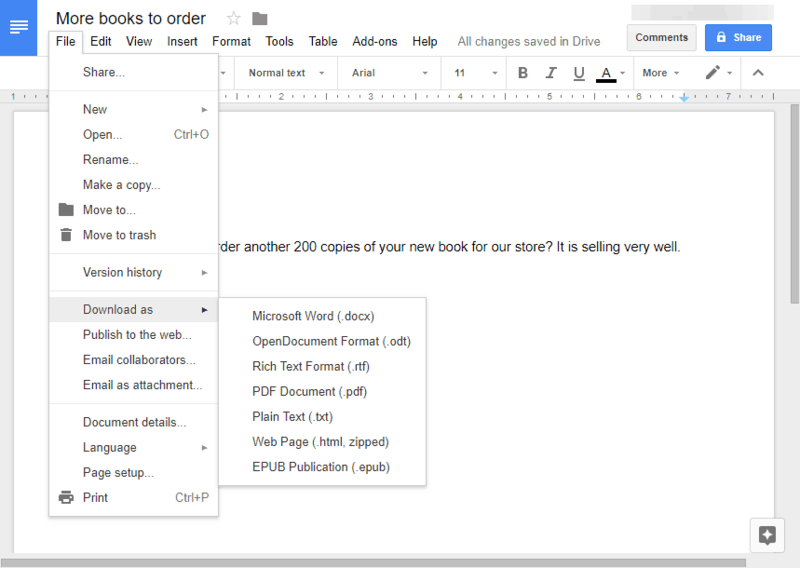 MakeTechEasier – Export and Retain Formatting from Google Docs – A tutorial on exporting a file from Google Docs and retaining formatting. Although there are a number of different file formats that can export a Google Docs file, they do not always retain exactly the same formatting as the original. Canon Support – Sending faxes from your computer (PC Fax) (MF8580Cdw/MF8280Cw) – Instructions on how to send a fax from a computer using Canon’s PC fax system. These instructions are for a commercial level multi-function printer/copier/scanner/fax machine, however, the workflow for most PC to Fax systems is the same.